FILL OUT INFO FORM OR E-MAIL US TO RECEIVE A DISCOUNTED QUOTE. The Pro-Series "Cartridge" pumps come with an angled 4" long 3/4" male thread pickup tube. Three sizes are available 360, 500, & 700 GPH. 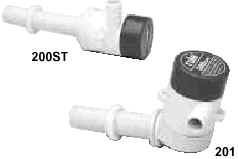 Replaceable motor cartridges are available (see below) that enable easy replacement without disturbing the plumbing! The A-Series Rule pumps come with an angled 4" long 3/4" male thread pickup port. The ST-Series comes with a straight 4-3/4" thread pickup port. Both the A & ST models come in 360, 500, & 700 GPH sizes. All models are 12VDC. 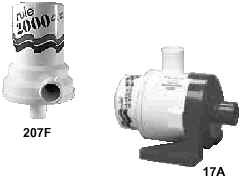 These pumps offer high flows for large baitwells, commercial livewells, and low pressure washdown applications. The Rule switch family offers a variety of configurations to meet your needs. They are available with or without a cover, 14 & 20 amp configurations, and three series � Rule-a-matic, Rule-a-matic Plus, & The Super Switch. 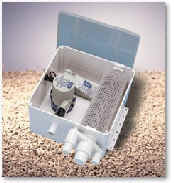 The shower sump pumps by Rule and Jabsco offer a compact, economical, and complete solution to shower evacuation. Each system comes complete with pump, switch, removable strainer, and reservoir. The Rule 97 series comes equipped with a 500 gallon per hour pump, 3/4" slip-on hose outlet and 1-1/2" slip-on inlet. The Jabsco 30296 series comes equipped with a 750 gallon per hour pump, 3/4" slip-on hose outlet and a multiple inlet manifold with 1-1/2", 1-1/8", and two 3/4" ports. The Rule 98 series has the same port arrangement as the Jabsco and includes an 800 gallon per hour pump.